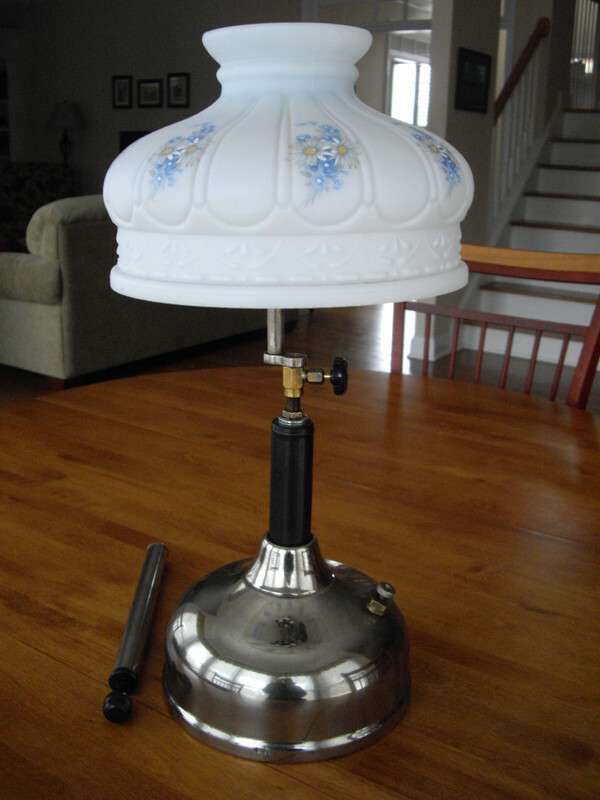 I was given this lamp last fall by an old rancher out of his grand parents house. I have no idea how long it has been since it was used. He is 80 and doesn't remember them using it. The ranch got electricity sometime in the mid 50's. It doesn't have a date or a letter on the valve wheel. I had some trouble getting the burner tubes cleaned out. I couldn't get them off and the burner caps wouldn't come off either. I messed with it and finally got it so it would burn properly. My next issue was getting a shade. The original shade wasn't in the house and I would guess it was broken like many of them are. I wanted to thank Rodney (RR_RES) for selling me this shade. It's a reproduction but I like it. Here are a couple of pictures. The first is the before picture. I love this lamp. I can see how a guy can really get into these. I now am looking for the shades everywhere I go. They are just beautiful. Keith - I agree that it is easy to get 'hooked' on these lamps! I think I have the cousin to yours! 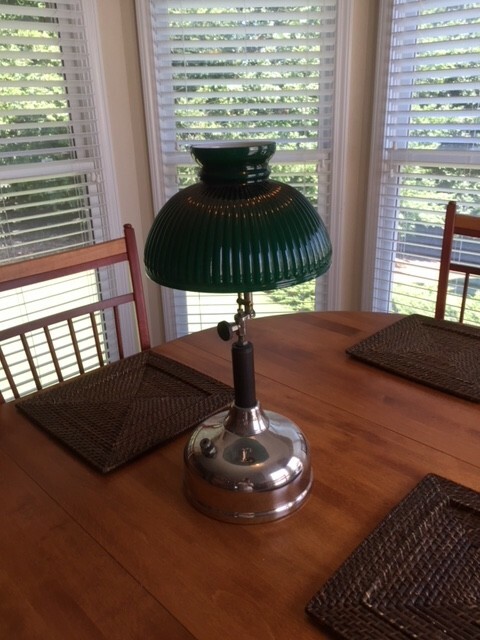 The lamp came to me in a neglected condition. After researching and input from fellow forum members I ended up with a nice display piece. It is amazing how interested visitors are when they see my lamps. Most had no idea Coleman ever made these treasures!! I think this is your lamp's cousin! lol!! That's a fine looking lamp, Keith, and the shade looks great on it. The last picture of it lit is great-nice work getting it going! And Ed, you have quite the nice lamps too! Such classy, vintage touches to a home. I agree, that’s a nice looking lamp and shade, Keith. I too am always looking for both glass and parchment shades when out and about. What a lovely lamp, I do like these table lamps. In Australia we find it hard to find any shades to suit. Well done and well saved. Great job getting it going! I love all of them that Coleman made. My coworkers are like ??? When I show them, and their jaw drops when I tell them they run off of white gas. Ed I do think they look like they're cousins. You have some beautiful shades there. I hope to be lucky enough to find some that look like that someday. Thank you Lee, Steve, Mark and Pete for your kind words. It sure gives a guy a great feeling when you finally get it cleaned up and running. This one gave me some trouble and I really wanted to see what the shade looked like when it was lit. It sure put a smile on my face.